My job for the past few years primarily involved developing eclipse based applications, and so, I’ve had to use eclipse full-time for quite some time. My pet peeve with eclipse has always been it’s usability. It’s not particularly keyboard friendly (not the same as having a gazillion keyboard shortcuts, which eclipse has plenty of), and the UI is just plain clunky. One thing that particularly annoyed me at some point was, not being able to conveniently switch between open tabs (editors, views), like you can with most other IDEs and text editors. Before you say it, I know there’s a Ctrl+F6 that brings up a quick switcher for editor tabs, but come on, it’s not even close to what I’d like it to be. And no, reassigning it to Ctrl+Tab just doesn’t cut it. 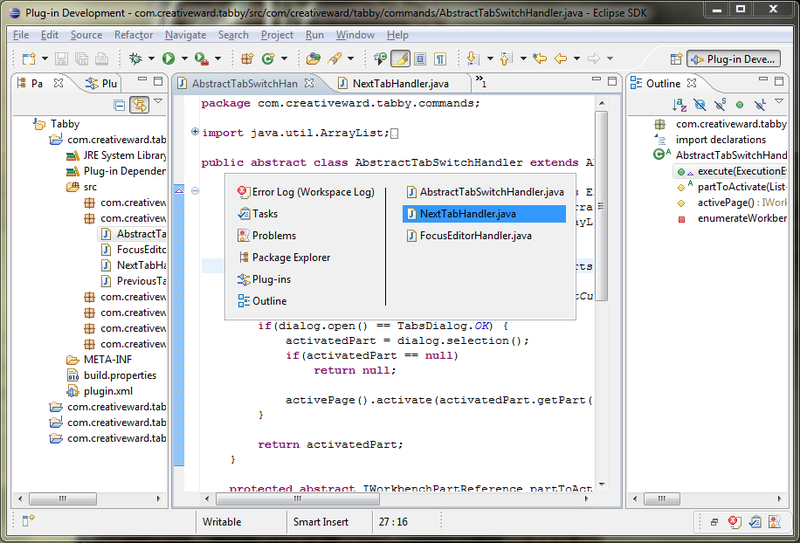 So, I went ahead and wrote tab switcher for eclipse sometime last year. Never really released it though, since there was always that one little feature I could add before it was “done”, and I never had the time for it. Regardless, I’ve been using it for some time, and it works just the way I like it. If you ever missed having a decent tab switcher for eclipse, try this one out. Esc – Switches focus to the last active editor. Useful when you’re navigating through views and would like to quickly get back to editing. You should advertize it a little, I guess it is worth. Good to know you found it useful. This is EXACTLY what I was looking for… Great work and thanks for creating this! !